Experience the evolution of productivity. Power through resource-exhausting and graphics-intensive workloads with the advanced design of the Dell Precision™ T5600*. Take charge of your workload with powerful Intel® Xeon® Processor and up to 128GB* of memory. Process large amounts of data with ease with up to four hard drives and an integrated Serial ATA (SATA) / Serial Attached SCSI (SAS) controller. The Dell Precision T5600 features a totally redesigned chassis, enabling you to perform service and modifications with greater ease than ever before. 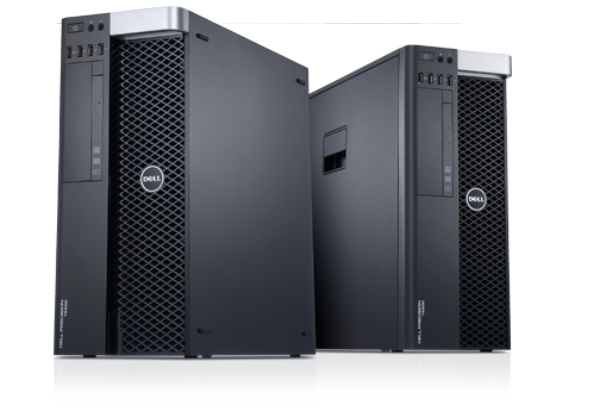 Your most important Workstation-class applications will run smoothly thanks to ISV certification available with the Dell Precision T5600. Save valuable time and resources by taking advantage of the flexibility and reliability of Dell Precision™ Workstations. Mitigate risk and help prevent work stoppages with Dell's exclusive Reliable Memory Technology*. A variety of NVIDIA® and AMD® graphics options, including powerful NVIDIA® Maximus™ technology, help you get the most out of your Workstation. Help save energy and reduce environmental impact with EPEAT® registered and ENERGY STAR® qualified configurations available with the Dell Precision™ T5600. Enjoy a suite of dedicated IT support 24/7. Dell ProSupport™ helps minimize downtime with phone, online or on-site support. Opt for Dell Next Business Day Onsite Service after Remote Diagnosis for on-site repairs. Protect assets with hardware encryption. Help protect sensitive data by opting for simple and easy-to-use security solutions. Encrypt data across your networks and external media with Dell Data Protection | Encryption. Dell.com has the accessories you need to complete your Dell Precision experience, including professional 3D mice and Dell UltraSharp™ monitors featuring PremierColor technology. Find it all here! Dell Managed Deployment services are for customers who need a comprehensive, end -to-end deployment solution. Managed deployments are useful within complex logistical environments, which require a single point of contact. Dell provides streamlined standard installation services so you can easily choose the specific package that quickly gets new systems into the workspace and old systems out. Dell can help you assess your PC deployment process and recommend ways in which you can improve efficiency, reduce complexity and maximize the return on your IT investment. Dell offers comprehensive training services, which include hardware and software training, as well as PC skills and professional development classes. Our flexible approach allows you to tailor classes to the needs and busy schedules of your employees with instructor-led classrooms or virtual courses, and even self-directed online options. Dell training can help improve system reliability, maximize productivity, and reduce end-user requests and downtime.